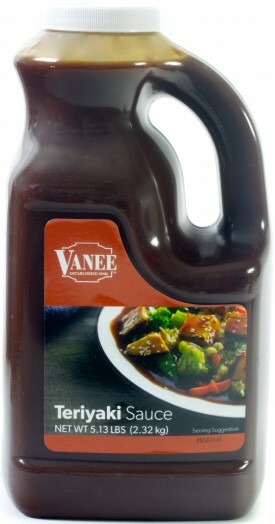 A rich, delicious, “out-of-the-jug” complement to virtually any protein, Teriyaki Sauce & Glaze boasts a rich flavor offset by fruity sweetness. Its lightly thickened texture helps it cling to food, making it ideal for basting, dipping, or stir-frying. Water, Sugar, Soy Sauce (Water, Wheat, Soybeans, Salt, Sodium Benzoate), Salt, Brown Sugar, Onion Powder, Hydrolyzed Soy Protein, Food Starch-Modified, Vinegar, Caramel Color, Citric Acid, Garlic Powder, Spice, Flavor, Xanthan Gum.